← Economics 101: Do we have a message from the Liberals? 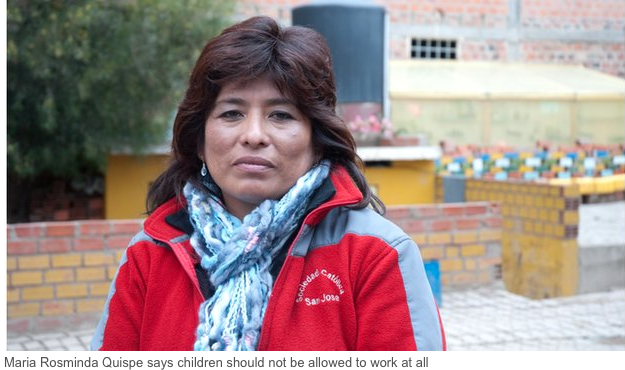 Child labour laws: A step back for advancing Bolivia? For nine-year-old Samuel Juan Ramos Gomez, brick making is part of everyday life. When he has finished school for the day, he puts down his pencil and picks up a shovel, helping his parents in the small brick factory at the back of his house. 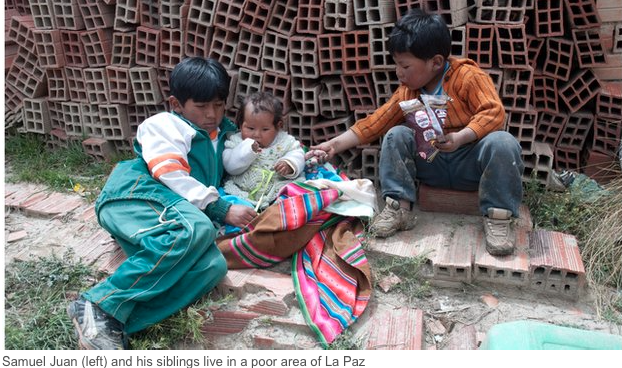 Samuel Juan’s family lives in a village called Alpacoma. 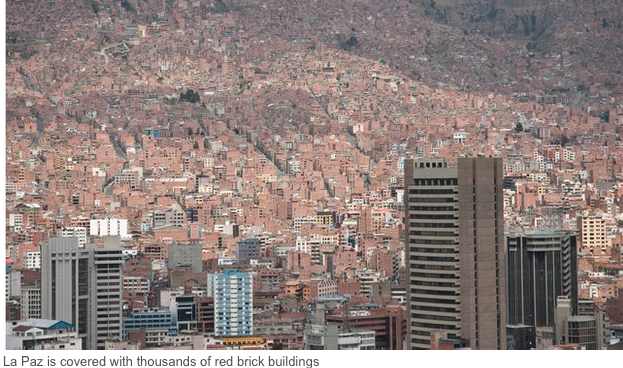 It is a mountainous area tucked away in a poor corner of La Paz. But it is rich with raw materials. Trucks constantly rumble through its centre, delivering piles of rubble to the villagers, who are mostly employed in the brick making industry. Samuel Juan’s body is not strong enough yet to be able to pick up bricks but when he turns 12 he can contribute to the wages and boost their current earnings of $72 (£46) a month. Samuel Juan’s family lives in a small room provided by their employer. He shares a bed with his parents, his younger brother Juan Manuel and his baby sister Naeli. 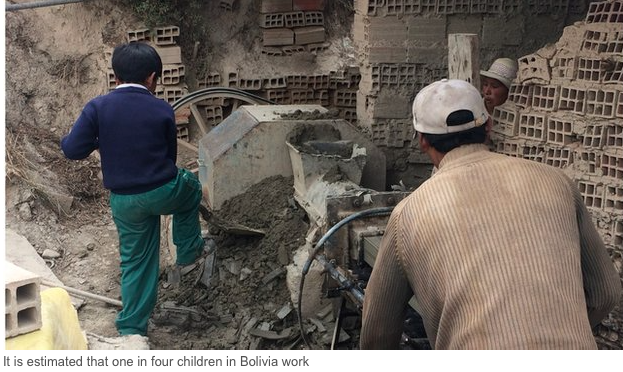 Most families in the town come from parts of Bolivia such as Potosi and Oruro – mining areas where children have traditionally worked in dangerous jobs from a young age. 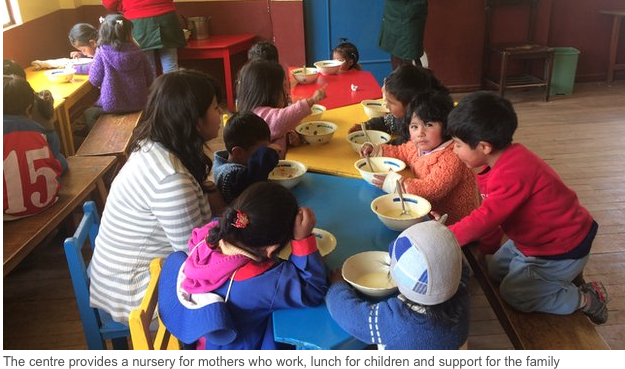 Recent figures are hard to come by, but in a report from 2008, it was estimated that about 800,000 children worked in Bolivia. Of that, 491,000 were under the age of 14. That equates to about one in four children. 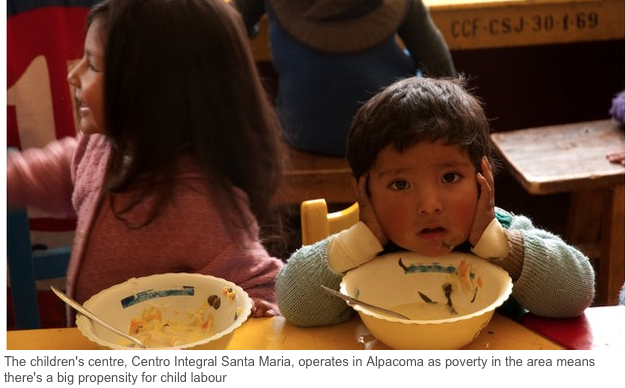 Bolivia is one of the poorest countries in Latin America. It has made huge economic strides in the past decade as a result of high commodity prices. With the money that it has earned, socialist President Evo Morales has boosted social spending programmes and his popularity among Bolivians recently gave him a third term as president. But a law passed in July that lowered the minimum working age was seen by many as a huge step back. The new bill kept the official minimum working age at 14, in line with international labour conventions in developing countries. But it introduced two exceptions. For children aged between 10 and 12, work is allowed if they attend school, are self-employed and get parental permission. And from 12, children can do light work for others – mining and brick making are not considered light work. In all cases, the work needs to be authorised and registered with a child protection officer. The International Labour Organization (ILO) argues that child labour should not be justified as a necessary evil, nor as a development strategy, but sponsors of the bill disagree. 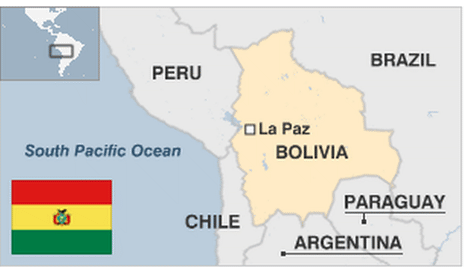 They say this law addresses Bolivia’s needs and is part of a plan to eradicate extreme poverty by 2025. “A step back would be turning a blind eye to the reality for the boys and girls who work,” says the politician Javier Zavaleta, who was one of the sponsors of the new bill. 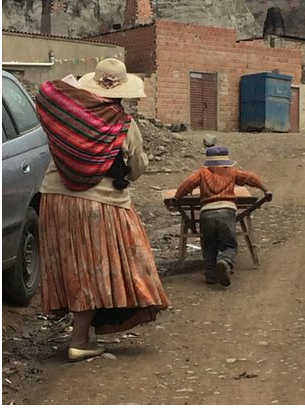 “Any man or woman from a developed country who walks around the poorest neighbourhoods of Bolivia will see things that they’ll never understand because poverty is really extreme in some parts in Bolivia. Back in Alpacoma, I met Maria Rosminda Quispe, who runs a centre offering families healthcare and educational facilities. Whether it is little boys helping in the brickworks or little girls looking after their younger siblings while their parents work, all forms of child labour are problematic, she says. “A child begins to lose his innocence and starts to assume an attitude of an adult,” she says. “Physically, their growth speeds up, they have wider shoulders, more calluses on their hands and they end up having the profile of an adult. For her, the law it is not a way out of poverty. Brian, a 14-year-old who comes to the centre to do homework every day, is an example of that reality. He has been making bricks with his family for as long as he can remember, putting in up to five hours a day. He would prefer to study if he had a choice. He wants to be an architect and his parents support him. But how to pay for his education? Make more bricks, he says. 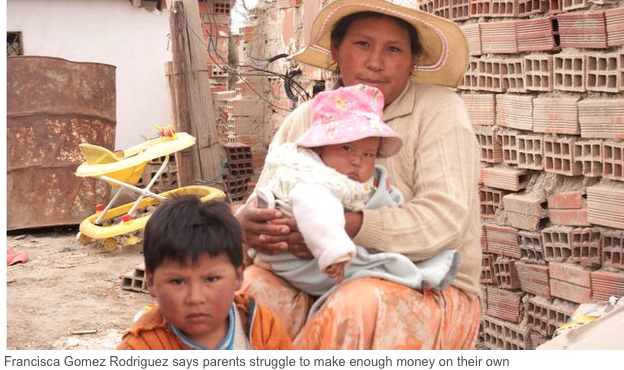 It is a vicious circle for many children in Bolivia. A very good article but sad, depicts our sad reality. The role of Unicef as part of multilateral aid agency is very weak, as those organizations had never questioned the host government… so there is very little hope, nor help we can receive from them to tackle this issue. So, it is us, the Bolivian society that needs to change this. A child deserves to be loved, to be given proper food, education, and health care. These working children when they become adults, most of them are bitter and lost all sense of pride and resentment accompanies the rest of their life… and invariably they repeat their parents’ actions. This entry was posted in Bolivia, Business, Economics, Health, La Paz, Politics, Social Unrest and tagged children labor, construction, demagogue, Ochlocracy, public policy failures. Bookmark the permalink.